Enhanced technology has brought people very close to each other and is constantly keeping them in touch by various social networking sites. 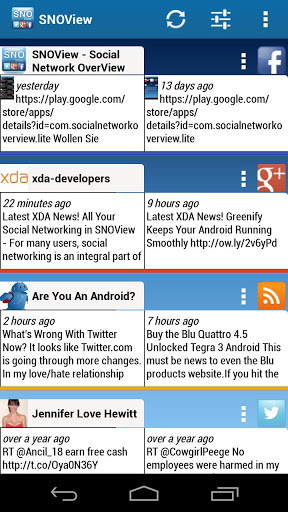 People now a days want to check out what their friends are up to on Facebook, have a group video conference on Google+, seeing your friends’ pictures shared on Instagram or visit XDA developers for having all the technical news about your phone. Accessing to all these sites you will require a different application for each on your Android Smartphone. As we know all the high end phones have the large RAM capacity due to which they do not lag in their performance when multitasking but what about the low budget smartphones ? If we use different applications for every of these sites then surely our phone will start lagging, so to sort out this problem developers have designed an application which will grant you access to all of your social networking accounts at once. SNOView (Social Network OverView), is the application that we are talking about, it clubs the biggest social networks including Twitter, Google+, Facebook, Instagram, and RSS feeds into a unique yet simple interface. The interface consists of vertically scrolling tabs, which display the feed subscribed to, and once pressed, show an expanded view of feed along with a vertically scrolling 3D cover flow of subscribed feeds and networks. 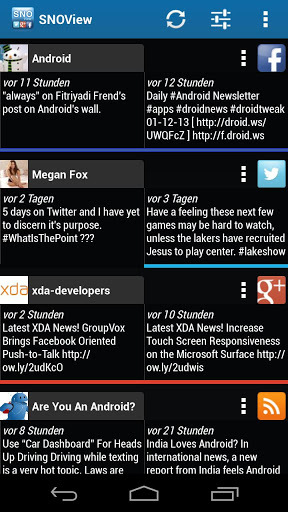 The application has a built-in browser that allows users to view their feeds. RSS Feeds for news sites such as CNN, Engadget etc. This application is very battery friendly and can be easily downloaded from the Google Play Store.